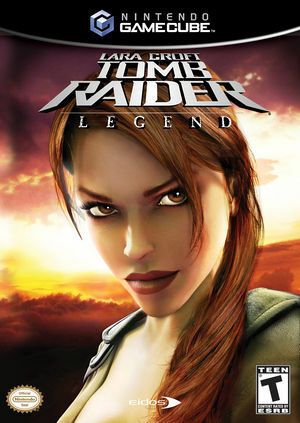 Tomb Raider: Legend is the 7th entry in the core Tomb Raider franchise. Published by Eidos Interactive, this is the first game in the series not to be handled by British-based Core Design, developed instead by British-owned U.S. studio Crystal Dynamics. The opening video (before the main menu) requires Real XFB, otherwise it just stays stuck on the copyright screen or shows black. Fortunately, there is only one pre-rendered video in the entire game and it has no connection to the story or gameplay. Because of the side effects of Real XFB, only turn it on to watch the video, and leave it off for gameplay. Fixed with Hybrid XFB in 5.0-5874. Throughout the game, there are pools of water with refraction and reflection effects. 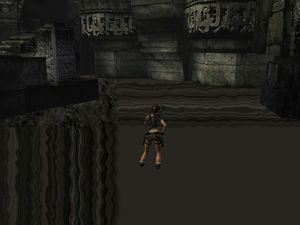 In this pools, a distorted image is overlaid where the pool would be, apparently copied from the environment's textures. The texture switches to other random textures depending on your view. The corrupt textures were fixed by 5.0-492, but water now requires EFB Copies to RAM to render correctly. Refer issue 7114. Fixed in 5.0-492. This code requires setting Graphics Config / Aspect Ratio / Force 16:9. The graph below charts the compatibility with Tomb Raider: Legend since Dolphin's 2.0 release, listing revisions only where a compatibility change occurred. 4.0-480 Slackware 14 AMD Athlon II X255 @ 3.1GHz NVIDIA GeForce 430 GT There is slowdowns but, game seems playable. I only played up to the Ghana area.